Over the weekend we headed up to Deer Valley to celebrate our five year anniversary (Dash and Isla Rose tagged along too!!). Here’s a look at what I wore to dinner! I’m totally loving the flare trend for the new season! What do you guys think, will you be sporting flares this fall? I don´t really like this “new” trend buy you look great in it! I love your outfit, simple yet elegant. Great look! Absolutely love the Celine! I think I’m finally sold on the flair trend! These fit you perfectly! You look so beautiful in this simple, casual outfit! I like your bag very much! in love with your handbag! such a gorgeous color! Really love this look Rachel!! these jeans look great on you! These jeans make you look like a thousand feet tall! So flattering! I love the dark wash too. The jeans are too long. They shouldn’t be dragging on the ground. I totally want to, but it depends if I can find myself the perfect pair! I really need a pair of flares for fall…such a great classic look! Obsessed with these flares! Gorgeous! Beautiful! I love the look! Simple but classic. And I definitely love flare jeans! I love your look! It’s so classic with the red lips and the white tee but it’s still unique with the flares! I have two pair of flares and I love them! The flares look so good on you and I love that bag! Love your purse and sunnies!!! These are the perfect pair of flared jeans! Love the red details with them. Love the look Rachel. I don’t know if I will get on board with flares… I like skinny jeans a lot… flares make me think of 5th grade – like 11th grade too much. Lol. But an outfit like this almost makes me reconsider. Great post!! Such a cute and classic look, Rach! Love the flares and those sunnies! Looking good girlfriend! This jeans fit your perfectly! OVE THE BAG! I’m loving the flared jeans trend! I already wore them pretty often before they became the trend, so now I guess I’m just in style again! You make jeans and a tee look so chic! I couldn’t pull it off if my life depended on it! Love the simplicity of this look yet it,s still very chic! Love this look! I’ve been wanting to try flared jeans, but I never know what shoes to wear with them! These boots peek through perfectly! Too cute! Love this casual look. I’ll for sure be rockin’ the flares! I’m obsessed with them and so happy they’re back in style. LOVE these flared jeans!! You look incredible!! These are super cute on you! I love that flare jeans are in again! Love the flared jeans and that they’re back in style! You look casual and chic. I’m not a huge fan of flares, but you look good. I love that purse! i HATE the new flare trend. i think it just looks messy usually, but somehow you make it look good. Those jeans are super cute! but could use a little hem. This is my favorite silhouette and just rocked mine a few days ago. Love these on you! Love those flares on you! Looks like you guys had a great time in Deer Valley. You live in such a beautiful place! I love how the 70s always find a way to make a comeback! 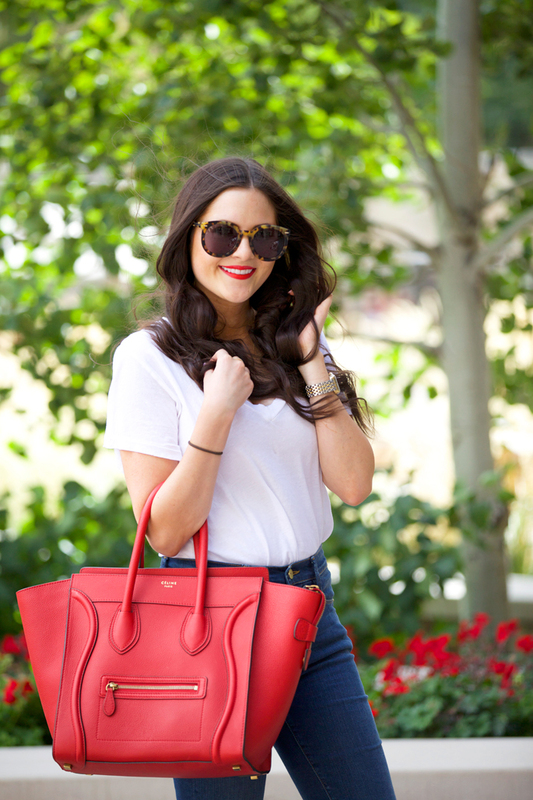 Flared jeans are so timeless and you paired it perfectly with a white tee and a pop of red! Loving this look with the high waisted jeans and simple t-shirt, you look great! These flares look amazing on you!! Your legs look so long!! That is definitely a big benefit of flared jeans. I’ve never stopped loving this style. As a denim lover, I think it’s so great to have so many options. Just because flared jeans are coming back strong, that doesn’t mean we can’t wear our skinny jeans. I love how you wore a simple v neck tee and tucked it in to completely showcase these gorgeous jeans. And I’m loving your red lips and bag that you’ve been wearing lately! Inspiring me to do the same!! Another beautiful post!!! Cute! Your legs look so long! I love it too! Looks perfect with your red bag! Super cute in flares! Such a simple and great look. You are rocking the flares! Gorgeous! This is such a cute look! I love the dramatic flare and the red lips and bag! Flared jeans look so good on you! Nah, I’m going to pass on this trend. The jeans are stunning! Happy anniversary! GREAT JEANS THEY LOOK SO COMFY AND A GREAT FIT! You are so beautiful!!! I love this simple red-white-blue outfit. Very patriotic! Love this outfit! Its the prefect way to dress up the a pair of jeans with a tee. Everyone was scared for flare Jeans to come back but I must say that I absolutely love this style and I am more than happy that we aren’t wearing skinny jeans any more all the time. Love the red Celine paired with the red flowers! So pretty! Love the flare jeans on you! So flattering! Flared jeans make your style a little bit old fashioned. Am I right? Rachel you rock those jeans!! I love that you kept it simple. You look stunning! Love the bag and flared jeans :) Have a great weekend! I absolutely adore the flare! I feel like I’m way too short to pull it off but you look fabulous! So happy that flares are coming back for the fall – such a flattering fit of jeans! Love the pop of red and how casual, but pulled-together this outfit is! I like this outfit so much!!! So pretty! Love the flares! Love these flares on you! Love the bag and lip combo! Looking great! Cute jeans! You look absolutely stunning in them. Love those flares and pop of red!